Osborn House on the Isle of Wight was Queen Victoria's private family home for 50 years. It was designed by her consort, Prince Albert, together with master builder Thomas Cubitt. Cubitt also designed much of Bloomsbury, Battersea Park and many of the historic streets and in London, Belgravia and Pimlico. The house was designed as an Italianate palazzo to take advantage of its seaside position on northeast of the island, not far from the sailing resort of Cowes where the famous regatta is held. When Queen Victoria first saw Osborne, she is reported to have said, "It is impossible to imagine a prettier spot." From 1843 to 1845, the royal family leased an 18th century house owned by an English aristocrat. Then, in 1845. Victoria and Albert bought the property and set about creating the house you see today. It was designed as a summer holiday home and a family retreat from formal court life in London and Windsor, It was also a place to entertain visiting diplomats and dignitaries in a less formal setting than the Palace or Castle. When Osborne House was first built, it had no ballroom or grand reception rooms, so if the Queen entertained there, it had to be during the summer months, on the lawns under a marquee. In 1892, the Durbar Wing expansion of the house included a large reception room and the fabulously decorated Durbar Room. After the death of Queen Victoria, the house — which had been her private home and not the property of the state — would have passed to her heirs. But King Edward VII did not need it and no other member of the royal family wanted the property or the expenses of running it In 1902, the King gave it to the nation and parts of it were open to the public as early as 1904. Over the years it has served as a convalescent hospital for military officers and as a naval college. In 1986, English Heritage took over its management and has been gradually restoring and renovating, opening more of the house every year. 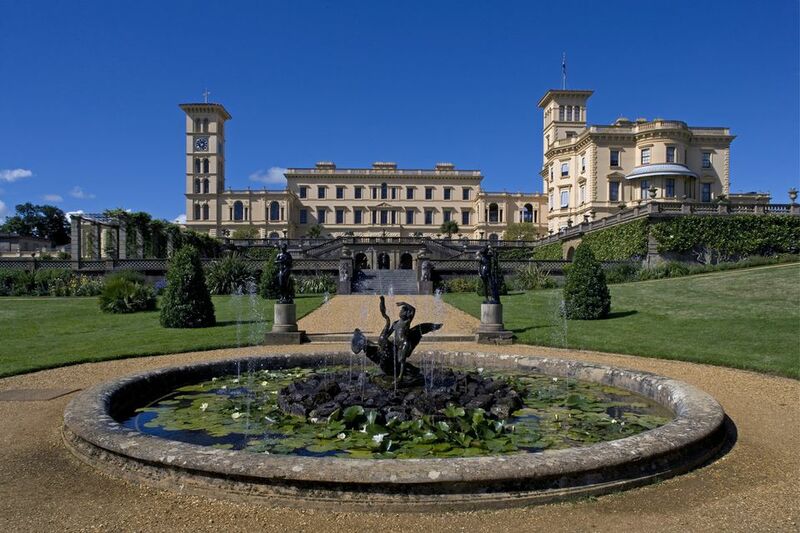 A visit to Osborne House includes a chance to visit Victoria and Albert's private rooms. They had been sealed in 1901 on the orders of King Edward VII but were opened to the public in 1954 after Queen Elizabeth II gave permission. Family Rooms: These rooms offer an intimate glimpse into the private lives of Albert, Victoria and their nine children. The nursery has been restored and furnished as it might have been when the royal family was in residence. You can also see the queen's personal bath and the bedroom where she died in 1901. Albert's private suite, was virtually untouched after he died and some of the things he used are still where he left them. The State Rooms: The rooms where the queen entertained dignitaries and celebrities and conducted state business include a Council Room where she met with members of her Privy Council; a dining room set for a formal dinner in 1850; an opulent drawing room, decorated with yellow satin, mirrors and cut glass, and a billiards room where the queen and ladies of her court sometimes played. The Durbar Room: This state room deserves special mention because of its elaborate, Indian-style decoration.The room reflected Queen Victoria's role as Empress of India. It was designed by Rudyard Kipling's father, Lockwood Kipling, and Indian master carver Bhai Ram Singh. The Queen's Beach and Bathing Machine: The private beach was opened to the public in 2012. Families can swim and picnic there. During the summer months, there are traditional Punch and Judy shows. A shuttle bus takes visitors from the house to the beach throughout the day. While you are at the beach, you can have a look inside Queen Victoria's "bathing machine." In the Victorian era, swimming in the sea was a new thing and something in which women rarely indulged. But fashions changed and it was considered healthy to immerse oneself in salt water — or at least get a bit wet. The bathing machines were little cabins on wheels that were towed out into sea by horses — or sometimes servants. Inside would be a change of dry clothing and other supplies. When the bathing machine was in place, the ladies, dressed head to toe in Victorian swimming costumes, would be helped down a short flight of steps, into the water. At Osborne House, you can go inside Queen Victoria's machine. The Swiss Cottage: Some distance from the main house, a Swiss-style chalet was built for Victoria and Albert's children to learn homely skills. They prepared cakes and tarts for tea on child-sized kitchen equipment and, just a few years ago, a dairy where they could learn to make butter and cheese was discovered behind a boarded up door. The Isle of Wight is a flattened diamond-shaped island in the Solent, a narrow channel across the mouth of Southampton and Portsmouth harbors. Getting there involves crossing by either ferry or Hovercraft. Taxis are available at all the ports for the short trip to Osborne House. Red Funnel Ferries operate car ferries from Southampton to East Cowes, 1.5 miles from the house. Wightlink Ferries operate fast catamaran services from Portsmouth Harbour Rail Station to Ryde, about seven miles away. HoverTravel offer the last hovercraft passenger services in the UK, between Southsea, Portsmouth Harbour to Ryde.The trip takes only 10 minutes and if you've never experienced a flight on a hovercraft, it's fun to try. Osborne House and grounds are open year round, but opening times vary seasonally. Be sure to check the website for opening times and prices. The Needles Chair Lift: A chair lift from the clifftops to the beach north of the Needles give you a different view of them. Cowes: The sailing and yachting village of Cowes is fun to explore and visit for shopping, dining and looking at great sailing yachts. Dinosaur Isle: A good rainy day attraction for families, this museum/exhibition is all about the many dino fossils found on the Isle of Wight, one of Europe's most important dinosaur sites. Was Silbury Hill, Wiltshire's Pyramid, Really Just an Accident?